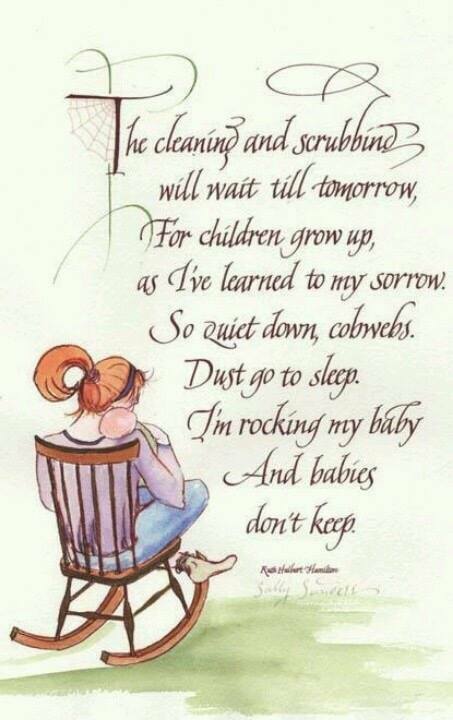 THE CLEANING AND SCRUBBING WILL WAIT TILL TOMORROW, FOR THE - ProudMummy.com the Web's Community for Mums. THE CLEANING AND SCRUBBING WILL WAIT TILL TOMORROW, FOR THE CHILDREN GROW UP, AS I'VE LEARNED TO MY SORROW. SO QUIET DOWN, COBWEBS. DUST GO TO SLEEP. I'M ROCKING MY BABY AND BABIES DON'T KEEP. So true, wait until they are 3 then give them a wet wipe and get them to help you!! Wanna know how I got this ball pit for free from.amazon ?